The HiScribe SP6 RNA Synthesis Kit is designed for the in vitro transcription of RNA using SP6 RNA Polymerase. This kit is suitable for synthesis of high yield RNA transcripts and for incorporation of cap analogs (not included) or modified nucleotides (not included) to obtain capped, biotin-labeled or dye-labeled RNA. The kit is also capable of synthesizing high specific activity radiolabeled RNA for use as probes or targets. RNA synthesized from this kit is suitable for many applications including RNA structure and function studies, ribozyme biochemistry, probes for RNase protection or gel shift assays, hybridization-based blots, anti-sense RNA or RNAi experiments, microarray analysis, microinjection, sgRNA synthesis and in vitro translation studies. This kit contains sufficient reagents for 50 reactions of 25 µl each. Each standard reaction yields ≥ 80 µg of RNA from 1 µg SP6 Control Template DNA. Each kit can yield ≥ 4 mg of RNA. Figure 1: Transcription by SP6 RNA Polymerase. Reactions with 1 μg linearized plasmid DNA templates were incubated at 37°C in a PCR machine according to the manufacturer’s recommendations. Transcripts were treated with DNase I, purified by LiCl precipitation and quantified using a NanoDrop™ Spectrophotometer. The HiScribe SP6 RNA Synthesis Kit from NEB is faster and achieves higher yields for RNAs of various lengths. DNA Template: The DNA template must be linear and contain the SP6 RNA Polymerase promoter with the correct orientation in relation to the target sequence to be transcribed. What is the promoter sequence for SP6 RNA Polymerase? Does transcription with SP6 RNA Polymerase require a primer? Does SP6 RNA Polymerase leave an extra base at the end of the transcript? Will SP6 RNA Polymerase initiate transcription from a single-stranded DNA template? Will SP6 RNA Polymerase work on an uncut plasmid? Can aberrant RNA be produced using SP6 RNA polymerase? Can kit components from the HiScribe SP6 RNA Synthesis Kit be substituted with SP6 RNA Polymerase and Reaction Buffer (NEB #M0207)? What is the sequence of the SP6 Control Template? The SP6 control template is a linearized plasmid containing the Cypridina luciferase (CLuc) gene under the transcriptional control of the SP6 promoter. The size of the run-off transcript is 1.76 kb. 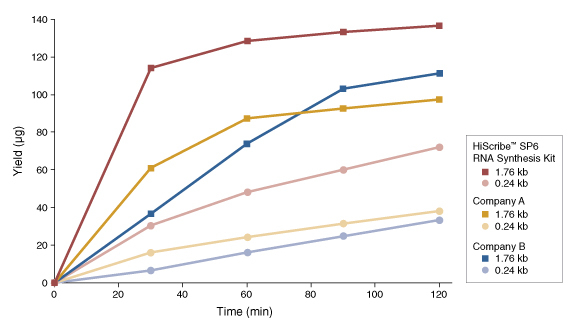 The control reaction should yield ≥ 80 µg of RNA in 2 hours. If the control reaction is not working, there may be technical problems during the reaction set up. Repeat the reaction by following the protocol carefully; take every precaution to avoid RNase contamination. Contact NEB for technical assistance. The control plasmid pCLuc-SP6 sequence can be found within the DNA Sequences and Maps Tool. The pCLuc-SP6 control template is generated by linearizing the plasmid with XbaI. If the transcription reaction with your template generates full-length RNA, but the yield is significantly lower than expected, it is possible that contaminants in the DNA template are inhibiting the RNA polymerase, or the DNA concentration may be incorrect. Alternatively, additional purification of DNA template may be required. Phenol:chloroform extraction is recommended (see template DNA preparation section). If the RNA appears degraded (e.g. smeared) on a denaturing agarose or polyacrylamide gel, the DNA template is most likely contaminated with RNase. DNA templates contaminated with RNAse can affect the length and yield of RNA synthesized (a smear below the expected transcript length). If the plasmid DNA template is contaminated with RNase, perform phenol:chloroform extraction followed by ethanol precipitation. Dissolve the DNA in nuclease-free water (see template DNA preparation section). If the RNA transcript appears larger than expected on a denaturing gel, template plasmid DNA may be incompletely digested. Even small amounts of circular DNA can produce large amounts of long transcripts. Check the template for complete digestion on an agarose gel compared to an uncut plasmid sample. If undigested plasmid is confirmed, repeat the restriction enzyme digestion. Larger size bands may also be observed when the RNA transcript is not completely denatured due to the presence of strong secondary structure. If denaturing gel analysis shows the presence of smaller bands than expected, it is most likely due to premature termination by the polymerase. Some sequences which resemble the SP6 RNA Polymerase termination signal may cause premature termination. For GC-rich templates, or templates with secondary structure, incubation at 42°C may improve the yield of full-length transcript. If premature termination of transcription is found in high specific activity radiolabeled RNA probe synthesis, increase the concentration of the “limiting nucleotide”. Additional unlabeled limiting NTP can be added to the reaction to increase the proportion of full-length transcript, however the improvement in yield of full-length product will compromise the specific activity of the probe.